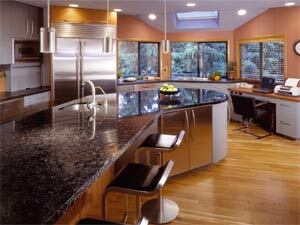 A dramatic, professional, restaurant style kitchen that "sizzles" in Bellevue. Whether your home needs a facelift or a major addition, Showplace Design and Remodeling is capable of delivering all the services you need. In business since 1978 the Showplace has completed over 24 hundred kitchen and bath projects and is an industry leader recognized by the National Kitchen and Bath Association, the National Association of Home Builders and the Master Builders Association. All of our professional designers are certified with the National Kitchen and Bath Association, and design your project to fit your budget. As a licensed general contractor, the Showplace covers your project from concept to completion allowing you the convenience of only having to deal with one company. They back their work with a five year warranty. Receive $500 OFF any contracted project of $20,000-$50,000. Receive $1000 OFF any contracted project of $50,000 or more.